Mike Yeo won in his first game as Blues coach, a day after he replaced Ken Hitchcock and Jake Allen won his first game in a month. 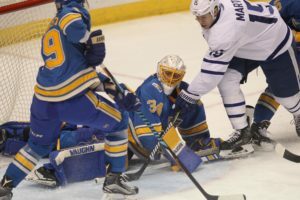 He stopped 26 shots and Paul Stastny scored twice to help the Blues beat the Toronto Maple Leafs 5-1 on a night when the team retired the number 5 of Bob Plager at Scottrade Center. Vladimir Tarasenko, Alexander Steen and Colton Parayko also scored for the Blues, which had lost five of its last six. The Blues also broke a four-game home losing streak, thanks to a three goal spurt in a span of 4:35 in the second period. Allen won for the first time since Jan. 2, when the Blues beat the Chicago Blackhawks 4-1 in the Winter Classic. He had been pulled in four of his previous five starts. Mike Yeo on getting his first win.